Chicago architect Andrew Rebori designed this striking modern-art style building in 1938. Rounded glass blocks and horizontal lines define the exterior. Rebori built two houses on the lot and left an open courtyard to increase the sense of light and space. Current homeowner Russ Rosenzweig feels the choice of using glass brick provides privacy yet "floods [the room] with light, and it's like being inside a sculpture." Modern furniture and contemporary art accent the streamlined rooms. The home is one of the best examples of Chicago's architectural creativity. Commissioned by his mother-in-law, artist Lillian Florsheim, this project was a connection between a pair of small townhouses built on a narrow lot designed by architect Andrew Rebori in 1938. With his bridge kitchen, Goldberg united the two houses built around a small courtyard. 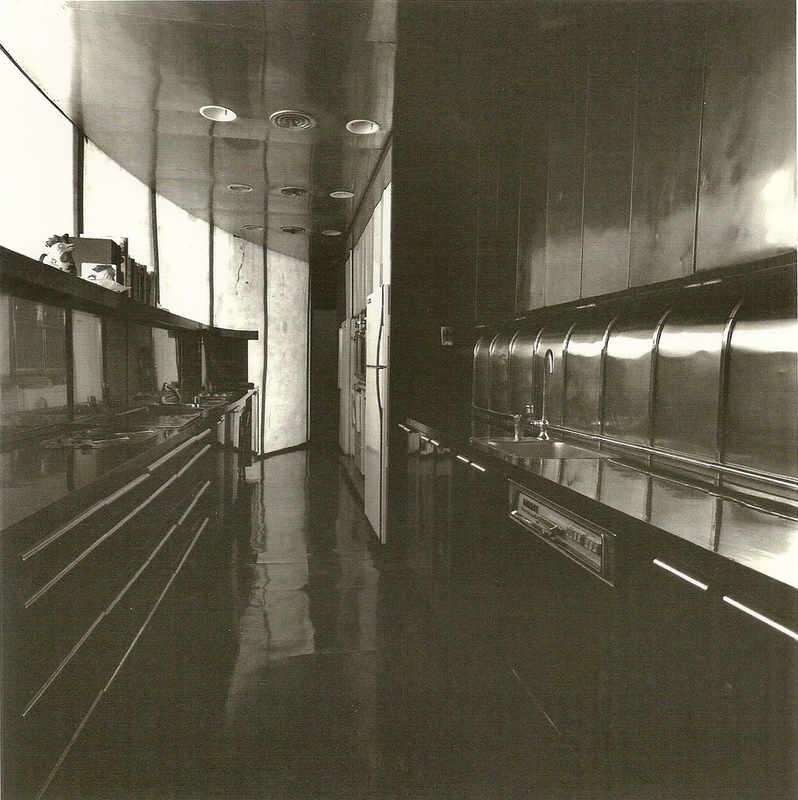 The kitchen measured only 35' by 8.5' and was inspired by Goldberg's research into railway galley kitchens. It was suspended from two I beams, spanning the courtyard. Metal rods (in tension) held up the floor and a fiberglass screen wall enclosed the structure. The novel kitchen was featured in number of publications. A Chicago Tribune Magazine article literally described it in glowing terms, "with its luminous plastic wall, the second floor kitchen, seen from the courtyard at night resembles a giant ribbed Chinese lantern." Home and Garden wrote: "One of the most adventurous kitchen designs ever shown in H&G is no research project but the practical answer to a specific building problem. Bertrand Goldberg Associates undertook the challenging task of designing a kitchen that could serve second-floor living and dining areas in two houses separated by a courtyard: the courtyard was to be left exactly the way it was. Their answer was a ‘bridge kitchen,' 35’ long and 8Â½ feet wide, suspended by steel beams above the yard. A curved wall of rigid opaque plastic panels takes the place of windows, adds a pleasing architectural form. Inside, equipment is finished in black, white, or stainless steel lines the walls. The counters of black metal match the cabinets whose contents are identified on plastic handles. Between countertops and wall cabinets are compartments for bulky appliances (they call them ‘garages') with push-up metal doors. The dramatic color scheme has a purpose. The highly reflective qualities of the metal, the black vinyl floor and stainless steel ceiling, make the narrow kitchen look larger." Copyright © 2016 FlorsheimMansion.com. All Rights Reserved.